iPad display is perfect now. That was fast! Droid (with Dolphin browser) is too. Much better mobile experience even with the full site. Nice! I tried to see If I could change that being the Groups creator but no such luck I also cant figure out how to make a group icon avitar either. Anyone been able to find the User Command Post? Can we still give greens? Love how we can embed videos now! The member list is available fairly quickly from the |Forums| tab, and then Community -> Member List. I largely took the defaults from vBulletin, figuring that, as a UI developer myself, they had put a fair amount of effort into improving their UI. 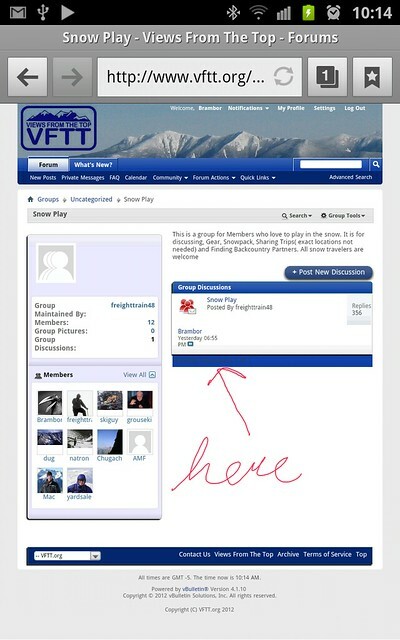 If you use the Mount Washington Observatory forums, you are already used to vBulletin 4. There are some places where the font-on-backgrounds are not perfect. I will go through them over time. 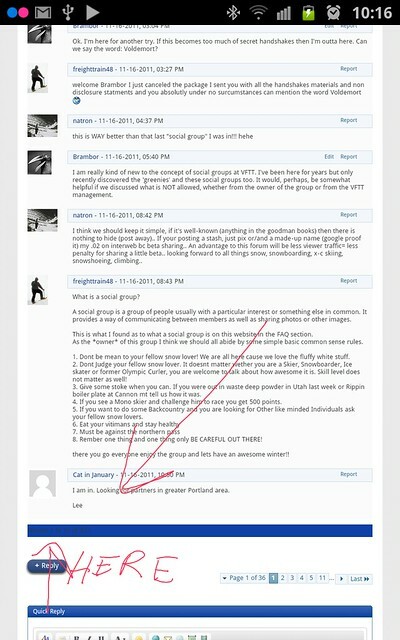 The forums and PMs look decent (IMO) and that was my goal. I didn't do anything, so that is interesting. Maybe a proper mobile style sheet finally loaded? I am not yet a mobile or tablet user myself. Greenies are available via the little star below every post. You can view your greenies under "Settings" available at the top right of the page. There are a handful of ways to find things - I didn't take anything away. Nice job. Special thanks to Tim. Check is in the mail. I fixed the dark-on-dark for "My Profile" and I think likewise for user groups. Brambor, can you confirm? I have one. I forgot to set the board variable for favicon. I don't have access to the installation from work, so I will get to it tonight. It looks "right" on my computer because I had set it for the test site, and the browser is reusing the cached copy for now. That's why I missed it. Incidentally, I am entirely in favor of artistic contributions from other members, like the favicon, or if you are an experienced vBulletin style creator, or the banner image (which is mine from Moosilauke this winter.) The banner image should be a view from the top of something, but it can be updated once per season and could be from the ADKs or CATs too - doesn't have to be from the Whites. Last edited by bikehikeskifish; 02-09-2012 at 11:09 AM. Tim, wondered where the current banner came from...Really nice. We could even run a View from the Top contest for banner for a given period of time. I'm sure we have enough talented members who might assist with the appearance of the forums, skins, etc. You can get the member list by clicking the drop down "Community" in the title bar.